An artist's illustration of astronauts visiting an asteroid as part of NASA's Asteroid Redirect Mission. The Trump administration released its 2018 budget request today (March 16), a proposal that calls for the cancellation of NASA's astronauts-to-an-asteroid mission along with four Earth Science missions and NASA's Office of Education. The White House's first budget request for NASA offers $19.1 billion for the space agency in 2018, a 0.8-percent decrease from 2017 space-spending levels, according to the Office of Management and Budget. NASA is currently working under funding approved by a continuing resolution that expires April 28. "NASA will investigate approaches for reducing the costs of exploration missions to enable a more expansive exploration program," OMB officials wrote in the budget summary. In a statement, NASA's acting chief Robert Lightfoot said the proposed cancellation of ARM won't result in the loss of some work for that mission. 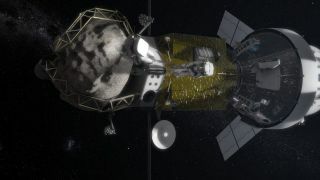 “We remain committed to the next human missions to deep space, but we will not pursue the Asteroid Redirect Mission (ARM) with this budget," Lightfoot said in a statement. "We will continue the solar electric propulsion efforts benefitting from those developments for future in space transportation initiatives." The budget request also pledges more support for public-private partnerships for U.S. space exploration, but did not include specific funding initiatives. "The Budget creates new opportunities for collaboration with industry on space station operations, supports public-private partnerships for deep-space habitation and exploration systems, funds data buys from companies operating small satellite constellations, and supports work with industry to develop and commercialize new space technologies," OMB officials wrote. NASA's Earth Science division would receive $1.8 billion in 2018 under the proposed budget, which is $102 million less than 2017 funding levels, but four missions would be canceled outright. Those missions include the Plankton, Aerosol, Cloud, ocean Ecosystem (PACE) satellite to monitor Earth's ocean health and atmosphere in 2022; the Orbiting Carbon Observatory-3 experiment that would track carbon-dioxide levels from the International Space Station; the Climate Absolute Radiance and Refractivity Observatory (CLARREO) pathfinder Earth climate instrument for the ISS in 2020 time frame; and, finally, the Deep Space Climate Observatory(DSCOVR), a joint NASA-NOAA mission that is in orbit today and monitoring Earth from space. The OMB budget summary did not include details on why those four Earth science missions were singled out by the Trump administration. “Overall science funding is stable, although some missions in development will not go forward and others will see increases," Lightfoot said in the statement. "We remain committed to studying our home planet and the universe, but are reshaping our focus within the resources available to us – a budget not far from where we have been in recent years, and which enables our wide-ranging science work on many fronts." NASA's Office of Education, which the OMB says has a budget of $115 million, would be eliminated under Trump's budget. "The Office of Education has experienced significant challenges in implementing a NASA-wide education strategy and is performing functions that are duplicative of other parts of the agency," OMB officials wrote. "While this budget no longer funds a formal Office of Education, NASA will continue to inspire the next generation through our missions and channel education efforts in a more focused way through the robust portfolio of our Science Mission Directorate," Lightfoot said. "We will also continue to use every opportunity to support the next generation through engagement in our missions and the many ways that our work encourages the public to discover more. NASA's planetary science division would receive $1.9 billion in 2018 under Trump's budget, a plan that includes funding for the 2020 Mars rover and the Europa Clipper mission to explore Jupiter's icy, ocean-harboring moon. That would be an increase from $1.63 billion for planetary science that NASA received previously, according to SpaceNews. But there is no funding for a Europa landing mission. "To preserve the balance of NASA's science portfolio and maintain flexibility to conduct missions that were determined to be more important by the science community, the Budget provides no funding for a multi-billion-dollar mission to land on Europa," OMB officials wrote. "The Budget also supports initiatives that use smaller, less expensive satellites to advance science in a cost-effective manner." The Trump budget also includes funding for several technology-research programs covering supersonic transportation, in-space satellite servicing and cybersecurity. On the aeronautics side, the budget offers $624 million in funding in a move the OMB said "paves the way for eventual over-land commercial supersonic flights and safer, more efficient air travel with a strong program of aeronautics research." The budget also seeks to restructure a NASA satellite-refueling-demonstration mission and lowers its funding by $88 million (compared to 2017 levels) to "reduce its cost and better position it to support a nascent commercial satellite servicing industry." And finally, the budget pledges to strengthen NASA's cybersecurity capabilities, but offered no funding details. The White House's 2018 budget proposal will now head to Congress for debate in the House of Representatives and the Senate in upcoming weeks. “While the budget and appropriation process still has a long way to go, this budget enables us to continue our work with industry to enhance government capabilities, send humans deeper into space, continue our innovative aeronautics efforts and explore our universe," Lightfoot said. You can read the full White House 2018 Budget Request blueprint here.